The day 2 keynote was excellent from David DeWitt. The main differences of Hekaton, In-Memory Databases is that it is memory optimized but durable, a very high performance OLTP engine, fully integrated into SQL Server 2014 and architected for modern CPUs. Other products on the market with in memory technology are Oracle TimesTen, IBM SolidDB and Volt VoltDB, but SAP Hana is not a direct competitor. This new technology is not the same as the old functionality of pinning a table in memory. 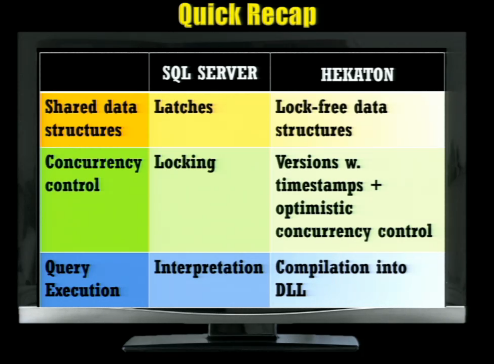 In the current core engine there is the need for concurrency control, locks and latches and interpreted query plans. 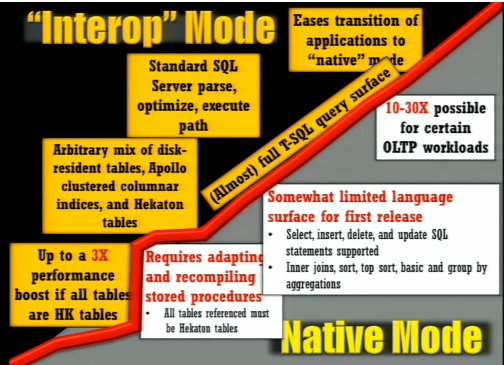 In the 1980’s the database field explorer had the use of many different concurrency control (CC) mechanisms. The technique (due to Jim Gray) known as 2 phase locking emerged as the standard. There are a variety of lock types including X(eXclusive) and S(shared). There are two simple rules to follow. Before access, the query must acquire an appropriate lock types from the lock manager and once a query releases a lock, no further locks can be acquired. Jim Gray won the ACM Turing Award for his work on transaction processing. A comparison between the two engines and the required 3 components. Timestamps are also used to create a total order for transactions to obtain equivalent of a serial order. The slide deck can be obtained from http://gsl.azurewebsites.net/People/dewitt.aspx and I would recommend looking at this excellent presentation. I have run some face to face focus groups but still need some further data and would like to obtain various views. 1.Do you think some best practices and procedures are more important than others for managing database systems? If so, what are the most important ones? 2.What best practices and procedures do you think should be considered when selecting different database engines? 3.What kind of requirements gathering and architectural design processes for the hardware, data and databases do you think are important? Why are these important? 4.In what ways do you think that best practices and procedures could assist management of the database lifecycle? 5.What complexities between technology layers, do you think, affect the operation of databases? 6.Describe any complexities that exist with the adoption of best practices and procedures when managing cloud databases? 7.Was there ever a time when you felt the complexity of database systems compromised your ability to implement best practices and procedures? 8.Who you think should create and control database best practices and procedures? 9.How, if at all, do cross boundary communications among stakeholders affect best practices and procedures? 10.What effect can a database management strategic plan have on best practices and procedures for the management of database systems? I have created an online forum where discussions on these questions can task place. The forum is http://sqltoolkit.freeforums.net/. I have created a discussion thread for each question. Please can you help and share your views. The keynote entitled Microsoft's Data Platform - The Road Ahead was delivered by Quentin Clark. The way forward is about delivering a complete data platform which is a continuous data solution. It is about a story of transformation from independent components being merged into one integrated whole solution. The analogy given was that of a department store. 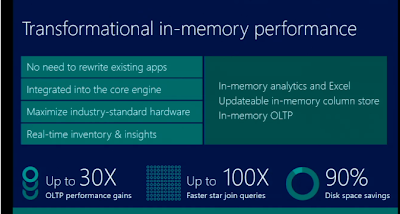 The new in-memory architecture built into the platform runs on existing hardware and delivers breakthrough performance. The architectural changes on the platform increase performance for OLTP, Analytics and Excel. Breakthroughs in availability and recovery mentioned the AlwaysOn secondaries in Windows Azure and backup to Windows Azure feature allowing for integrated hybrid products. The freely downloadable tool will support backups of all versions of SQL Server into Azure. Encryption support for backups is built into SQL Server 2014 with the certificates stored on premises. Data Files can be stored in Windows Azure. This addition means you can have a mix and match set of data files attached to a single database. Querying all data components include the new feature Polybase in PDW 2.0, that combines structured and unstructured data. Simplicity is the aim with the Hadoop projects, HDinsight and accelerated data warehousing provisioning. Real time insights for everyone can be drawn from the tools Power Query, Power Pivot, Power View, Power Map, Power BI Q & A and Power BI sites. The sharing of globally available information sets increases the understanding of data. The simplicity of data in Power BI Q & A allows you to ask a question in natural language. Concluding Quentin stated it is the excellence of all data that affects line of business and this will change how organizations compete. Big changes are coming in architecture design to build continuous platforms. The keynotes along with some other sessions will be broadcast live from the PASS Summit 2013 on PASStv. These technical sessions will be streamed between 16-18 October. I attended and helped at SQLSaturday Cambridge between 27-28 September 2013. The event was held at Queens College, Cambridge. This was a great location in the heart of Cambridge with the mathematical bridge for inspiration. The Microsoft Virtual Labs are useful for immersion in a virtual hands-on lab and allow experience the product first hand. The SQLSaturday Cambridge Community Day saw for the first time a shared day between SQL Server and SharePoint. An excellent combination as the use of SharePoint is still increasing and integrated heavily with SQL Server. The keynote was delivered by Buck Woody on what is big data. An interesting article mentioned during this was, What's Your Big Data Score? There were many interesting sessions on Sharepoint, Data Explorer, Azure, PDW and Hadoop. One very enjoyable and informative session was delivered by Carmel Gunn which showed the power of shared data sets using PowerPivot, Power Query, Power View and Power Map to gain insight on the Irish Economic Crisis. I also had the opportunity to run several PhD Research Study Groups. Anyone interesting in participating further in my research can take part in the online focus group discussions on this forum http://sqltoolkit.freeforums.net/ . There are 10 questions on best practices and procedures.